For more on Greece's struggle against austerity, click HERE. For more by Michael Lebowitz, click HERE. New York: Monthly Review Press, 2015. For more by or about Michael Lebowitz, click HERE. For more by Doug Enaa Greene. 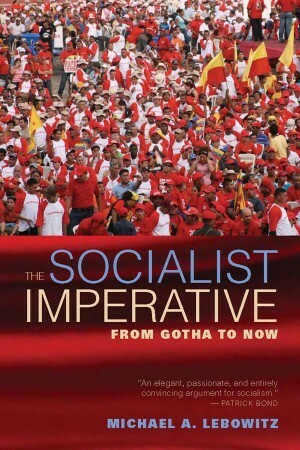 July 28, 2015 – Links International Journal of Socialist Renewal -- Those who open Michael Lebowitz's new book, The Socialist Imperative, will find something far different and refreshing than the old apologetic Soviet manuals on the smooth workings of a planned economy. What they will discover is a collection of writings inspired by Lebowitz's lifetime of activism and profound solidarity with the oppressed and exploited under capitalism and his revolutionary vision of how to build a socialist alternative. Click for more by or about John Riddell. May 17, 2015 -- Johnriddell.wordpress.com, posted at Links International Journal of Socialist Renewal with permission -- The following previously unpublished position paper, pulled from my archives, was written in 1992. I am posting it in conjunction with my review of Michael Lebowitz’s Contradictions of "Real Socialism". My comments raised many of the themes found in Lebowitz’s writings of that time, of which I was then quite unaware. My approach, however, gives more emphasis to the problem of economic allocation and the role of non-capitalist markets. Links International Journal of Socialist Renewal -- Michael Lebowitz's talk at the international seminar, "Socialism, democracy and visions for the 21st century", held in Hyderabad, India, on March 7-10, 2014.The seminar was organised by Telangana Vidhyavantula Vedika (Telangana Intellectuals Forum), Center for Dalit Studies and Democracy Dialogues. April 4, 2014 -- Newsclick -- Michael Lebowitz, a Canadian economist who has written extensively on Latin America and is a former resident in Venezuela, talks to Newsclick on the economic problems facing Venezuela and the recent protests there. He says these protests have been orchestrated by right-wing forces that want to get rid of the left-wing government. They are happening in rich neighbourhoods; the poor are not participating. Saying that these protests will not go very far and will fizzle out, Lebowitz points out that there is an underlying serious economic problem that did not originate with President Nicholas Maduro and have been building for quite a while. Lebowitz says the Trans-Pacific Partnership free-trade agreement is an international assault on the people and it can be countered only by an international response. March 2014 -- Monthly Review -- It is now one year since the unfortunate death of Hugo Chávez on March 5, 2013. Shortly after, the editors of Monthly Review quoted a letter from István Mészáros to John Bellamy Foster which described Chávez as “one of the greatest historical figures of our time” and “a deeply insightful revolutionary intellect” (“Notes from the Editors” in the May 2013 Monthly Review). Whether Chávez will be remembered over time this way, however, depends significantly on whether we build upon the foundations he began. Michael A Lebowitz intervjua av Darko Vesić og Aleksandar Stojanović. – Kapitalismen har vore i krise i mange år no, og dei kapitalistiske statane svarer på krisa med såkalla innstrammingstiltak. Ser me på dynamikken til kapitalismen dei seinaste femti åra, så var svaret på krisa på 1970-tallet det som no er kalla «nyliberalismen». Om ny vekst er svaret på krisa, kan me seie at nyliberalismen på 70-tallet hadde suksess. Men gjeld det same dagens «innstrammingstiltak»? - Eg trur me må sjå på somme av premissa i spørsmålet. For det første meiner ikkje alle marxistar at kapitalismen som eit heile er i krise, i motsetning til kapitalismen i spesielle område. For det andre, om kapitalismen er i total eller partiell krise, kva er årsaka? May 7, 2013 -- Left East,suggested to Links International Journal of Socialist Renewal by Michael Lebowitz. Darko Vesić and Aleksandar Stojanović: Capitalism has been in crisis for several years now and in response to this crisis the capitalist states practice so-called austerity measures. If we look at the historical dynamics of capitalism in the last half century, we see that they responded to the crisis of the 1970s with what is now called “neoliberalism”. If the restoration of growth is what must be carried out as a response to the crisis, we can say that neoliberalism of the 1970s was successful. Yet, can we say same of present-day “austerity measures”? A spectre is haunting the working class of Europe (both east and west) and the working class of developed capitalism in general. That spectre is the spectre of communism. For the working class, that frightful hobgoblin is a society of little freedom, a society of workers without power (in the workplace or community) and a society where decisions are made at the top by a vanguard party which views itself as the sole repository of truth. Of course, this was not what communism meant for Karl Marx and Frederick Engels nor, indeed, for Lenin. May 4, 2013 -- Links International Journal of Socialist Renewal -- If we don't understand a system as it is fully developed [its "being"] and thus its critical characteristics, we cannot investigate the "becoming" of those characteristics. This is why Marx discussed primitive (or original) accumulation of capital only at the end of volume 1 of Capital. Exclusive focus upon the emergence of the new elements, however, is not real history. "Becoming" is two sided: it is both a coming into being and a passing away. The concept of primitive accumulation explores only the former; it considers the new being born but not the old struggling to remain alive. It is, in short, one-sided. Not only does it fail to explore on its own the struggle of the old for its reproduction but it also does not consider the interaction, the morbid symptoms and dysfunction when two sets of productive relations are engaged in contested reproduction with respect to their control of the elements of production. February 16, 2013 -- In view of the latest devaluation of the Venezuelan currency (see articles below), Venezuela-based Canadian socialist Michael Lebowitz has provided Links International Journal of Socialist Renewal with the following paper written in 2010 at the request of socialist group Marea Socialista. We agree that the government decision to devalue the bolivar can be an important step toward providing greater funds for social programs and the state budget at all levels, reducing the unacceptable current level of imports, encouraging the development of exports other than oil and helping to create the conditions for new national production. However, by itself the burden of the devaluation measures will fall upon the working class. Therefore, to break clearly with the neoliberal model, it is essential that the government supplement its devaluation decision by accepting the following proposals. 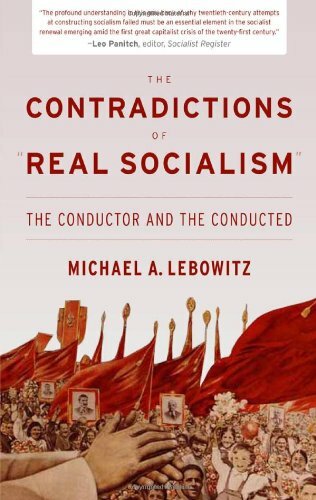 January 18, 2013 -- Since Monthly Review Press published Michael A. Lebowitz’s The Contradictions of “Real Socialism”: The Conductor and the Conducted it has generated quite a bit of discussion. Building on concepts he developed in The Socialist Alternative, Lebowitz examines the record of “real socialism”—the post-revolutionary societies of the 20th century, particularly in Russia and Eastern Europe. He makes a provocative argument that has implications for how we understand socialist planning and the struggle for socialism in the 21st century. Now, Monthly Review Press is offering a special discount of 35% off the list price and has asked Links International Journal of Socialist Renewal to make this offer available to its readers. This offer is good until the end of January. January 9, 2013 -- Links International Journal of Socialist Renewal -- Every socialist in the 21st century should try to answer two questions. First, why don’t workers put an end to capitalism – given its destruction of human beings and the environment (something Marx was so conscious of). In particular, given the declining standards of life for decades in the United States, the economic disaster in Europe and the current crises, how is it that the system is reproduced without a significant challenge by the working class? Second, why did the working class within what has become known as “real socialism” [the former Soviet Union and Eastern Europe] allow those systems to revert to capitalism without resistance from the working classes, who were presumably its beneficiaries? New York: Monthly Review Press, 2012. For Asia-Pacific readers it is also be available from Resistance Books. Indeed. The popular memory of the USSR is one of bureaucratic red tape, long lines for basic necessities and harsh repression. If the Marxist answer is that the inevitable outcome of any revolution is merely the drab and misery of the USSR, then it is best to accept capitalism (with all its warts). Or so we are led to believe. Michael Lebowitz: What makes the working class a revolutionary subject? Part of a mural by Crystal Howie. December 2012 -- Monthly Review -- What makes the working class a revolutionary subject? Not Hegelian mysticism — that it is the universal class or the vulgar copy of the Absolute Spirit. Nor is the working class a revolutionary subject because of its physical location — that it is strategically placed to stop the wheels of industry. Michael Lebowitz in Zagreb. Photo by Jovica Drobnjak. Click HERE for more articles by or about Michael Lebowitz. November 1, 2012 – Links International Journal of Socialist Renewal – The following interview with Michael Lebowitz was recently published in Novosti, a left-wing newspaper in Zagreb, Croatia. The Simón BolÍvar Symphony Orchestra, which is part of Venezuela’s Sistema, a world-famous program that connects young people from underprivileged backgrounds with classical music. The following is an excerpt from Michael Lebowitz’s new book, The Contradictions of "Real" Socialism: the conductor and the conducted, due to be released in mid-July 2012 by Monthly Review Press. It is posted with the kind permission of the author and Monthly Review Press. Readers of Links international Journal of Socialist Renewal are urged to order a copy HERE (USA). For Asia-Pacific readers it will also be available from Resistance Books.